Astronomy Ireland is asking members of the public to contact them if they witnessed a massive fireball which lit up Irish skies on Sunday night. Fireballs are caused when a large rock from space burns up in the atmosphere as it collides with Earth at speeds of the order of 100,000 mph. According to Astronomy Ireland, a huge explosion equivalent to thousands of tonnes of high-explosive shattered the peace and tranquility of Irish skies at 10.10pm last night. The organisation says the ‘huge fireball’ was seen from Donegal to Cork and all points in between, lighting up all of the island like daylight for about 5 seconds. The Irish Coast Guard at Valentia contacted Astronomy Ireland last night as they were receiving so many reports of possible distress flares. 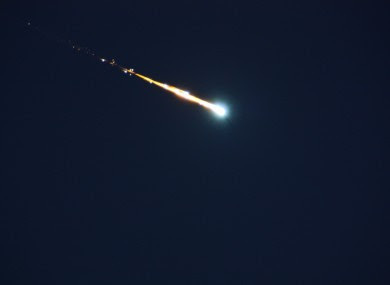 “This event was so bright that a piece or pieces may have survived the re-entry and landed as extremely rare and valuable meteorites” said David Moore. Any companies who operate CCTV cameras are also being asked to check their recordings for Sunday night around 10:10pm to see if they recorded the fireball near the horizon as photographic records like this are extremely valuable for the analysis. In 1999 a fireball resulted in fragments being found at Leighlinbridge in Co. Carlow. One collector offered a £20,000 sterling reward for these meteorites. In 1969, another fireball dropped fragments all across Northern Ireland, including one that smashed through the roof of a building in Sprucefield RUC Station. According to @AstronomyIRL a large fireball was spotted over Ireland last night. If you saw it they'd like you to tell them where & when. Massive fireball seen to the south tonight seen all over Ireland it was around 10:00pm. Any one spot it.